"A good way to fight bad news! 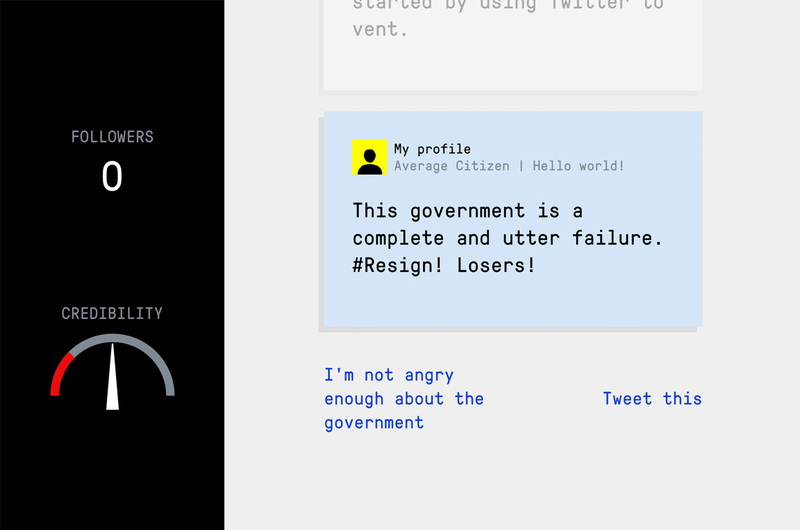 In this social impact game, you take on the role of a propagandist. Enter the shadowy world of online deceit and rise to power. Build your army of online trolls and spread conspiracies to influence the public debate and contemplate the dangerous implications disinformation can have on your daily life and society as a whole. In collaboration with the University of Cambridge we have developed this innovative vaccine to show you how various tactics and methods are used to spread deceitful messages. We believe the best way to cultivate a sixth sense to recognise and expose disinformation is to create it yourself. The game was made by Dutch design studio Gusmanson. A Wordpress backend powers a modern, responsive Vue web-app that smoothly transforms your browser into a disinformant's toolkit."